This is a pretty easy meal to make at home, especially as I did here using pre-marinated Burgundy & Pepper Lamb Tips from Trader Joe’s. These tips are pre-packaged and sold by weight, for 4 generous servings (8 medium-sized gyros) I chose the least expensive package at about $12. First, prepare the tzatziki sauce consisting of Greek style plain yogurt (e.g., Trader Joe’s), peeled cucumber – cut into small pieces, minced garlic, lots of dill (fresh and/or dried), black pepper, and a bit of apple cider vinegar or other vinegar if you like a bit more sharp flavor. Tzatziki is great for other dishes and sandwiches, so just put the left-over portion back in the yogurt container and keep even up to a week or more. Trim the lamb tips to remove any fat and sinew, cut the pieces across the grain to bite or two-bite size and sauté the pieces in a bit of oil until cooked to just nearly medium well. 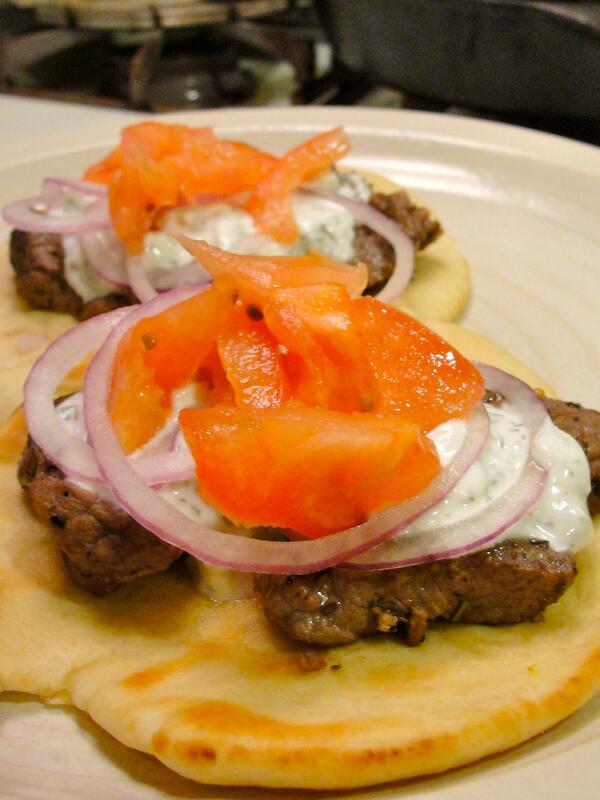 Warm pita in a pan until they just begin to brown, both sides (brush pita first with olive oil if the pita doesn’t contain oil, such as those from Trader Joe’s), and serve topped with lamb, slather on the tzatziki sauce, and add thinly sliced red onion, fresh tomato.